The more things change? 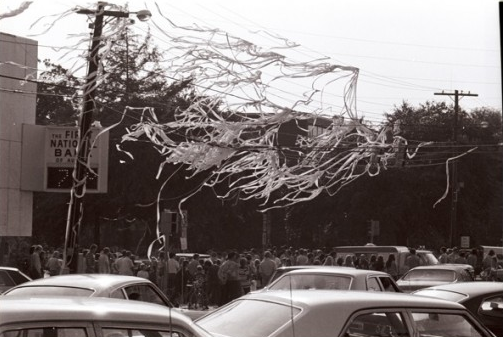 The power lines at Toomer’s Corner are rolled in 1972. TWER photo by Larry Parker. Come fall, you won’t be able to roll Toomer’s Corner on an around-the-block whim after kissing the bride, or after Bill Clinton is elected, or probably even after your average basketball victory (as monumental as that would be). As TWER first reported in March, the triangle of poles and wires that will serve as the temporary solution to rolling the corner will once again center celebrations in the middle of the street. Which means that rolling the corner—any rolling of the corner—would require closing the streets. Unless we’re talking football, that’s not likely to happen. That means that until new trees are planted away from the safety hazards of downtown traffic, every rolling of Toomer’s Corner will for several years likely have to be a planned activity instead of what it always was, or at least was meant to be: A reflex. At least seemingly. Though there is no schedule for the installation of the poles, Cowper says he wouldn’t expect them to go up “until just a few weeks before we need to,” i.e. the football season. I’m somewhat surprised no one has yet proposed an alternate safe-from-automobiles location on campus for flashmob, fandance, rolling festivities.